Published last year to great acclaim, Wild is now available in paperback. The cover is the first thing to grab your attention – a large girl’s face with huge hypnotic scribble brown eyes that draw you into the picture. Then surrounding her face, a huge tangle of grass and flowers and weeds masquerading as hair. Already, there’s a lot to discuss with your child. These large eyes are very distinct from Disney large eyes – this is no saccharine character representation. The story is simple – in fact the text is so minimal that some pages have just three words, and others none at all. It tells the tale of a little girl who has been nurtured in the wild – by nature – until one day, a new animal that looks like her comes along. The humans aim to ‘tame’ this wild child, but to no avail – she remains miserable and cross, so in the end she is returned to the wild – taking the family’s cat and dog with her. The beauty of this picture book – and I would recommend it for all age groups – lies in the illustrations – each one a picture in its own right – with plenty to discuss in each from the portrait on the title page to the flowers on the endpapers. The magic lies in the detail and the emotion of the illustration. For example, the page in which the girl swims with bears is notable for many factors, not only for the lush earthy tones (which are seen throughout the book), but also for the detailed expression on each separate animal’s face. Questions are raised – why are the bears hunting the fish and yet friends with the girl, and in fact, letting her eat with them? Why is the small bear on the rock frightened of a crab? Why does the mother seem more protective of the girl than its own cubs? There is an array of flora and fauna to discover on the banks too. In the illustrations in the human environment, the tones shift colour from earthy browns and greens to introduce some tonal reds, oranges and yellows, but the abundance of detail remains. The image of the girl playing with toys can be compared with her playing with foxes earlier – the human scene poses many questions – why has Emily Hughes included a sword and arrow in the girl’s playthings? What other toys did the adults deem appropriate? Why are patterns so woven into the human world? Overall, this could be read as a simple morality tale – nature utopian and good, civilisation evil, but I think that would be to misread the subtleties within. It’s an exploration of a child’s chaos and behaviour and our attempt to impose an order around it. It’s also an important tool for discovering where the reader’s sympathy may lie at different parts of the story. In the end do the adults learn a lesson, rather than the child? 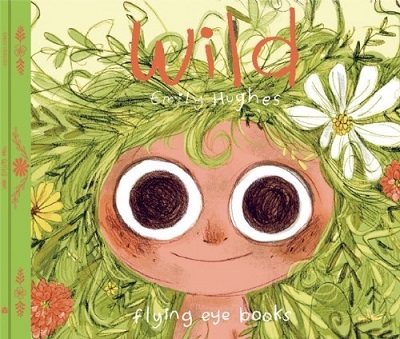 With allusions to Where the Wild Things Are, as well as to Eliza Doolittle, this is a picture book to be thoroughly pored over. If you do like this one, you can look out for Emily’s new book, The Little Gardener, publishing June. Purchase Wild from Waterstones. With thanks to Flying Eye Publishers for the review copy.